In the last entry I explored a few ways to save a buck while building up your supplies of defensive materials – that good old Class IV. Now when it comes to defense planning and prepping there’s a million things to do and always the need for more material. And even if you did nothing else but plan and prepare there’s still not going to be enough time in the world to get everything done. Continuing with defense planning in this entry I’m going to explore one way of determining which things and what measures should come before others. 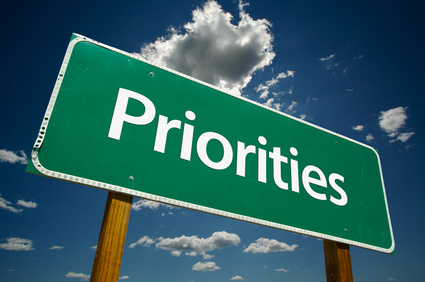 Why prioritize? Prioritizing your effort and resources is just plain common sense. It will normally allow you to get the best bang for your buck if you are faced with either limited time or resources. By establishing defensive priorities we can focus our efforts which hopefully will lead to the best compromise of defense vs. time vs. logistics (logistics in this case being what we have on hand in the way of material and capabilities). Prioritizing isn’t a one stop process either. It’s part of a cyclic process that is continuously reviewed based on several factors as a whole in the defensive planning process which will be the subject of the next blog entry. Lives – The lives of me, my family, and my tribe. Home – Our dwelling where we will most likely consolidate to face an attack. Land – pastures, fields, gardens, etc. Outbuildings – Barn, garage or shop, storage, etc. Criticality: The degree to which a listed item is essential to survival. The determination of criticality should be based on the impact of the loss or damage to the listed item to your survival. Vulnerability: The degree to which a listed item is susceptible to reconnaissance, attack, or how much damage probably would occur if attacked. This also includes the listed items ability to relocate in the event of an attack. This also includes your dependency on others and their resources as well. Recuperability: The degree to which an item on the list can be repaired or replaced in the event of damage in terms of time, equipment, and available manpower. Threat: The known or assumed probability of a listed item being targeted for reconnaissance or attack in conjunction with with known or assumed threat capabilities and TTPs. When I measure the threat I include all information (at a minimum the 5 Ws) from my intelligence gathering efforts and what possible threat hazards could an item face including both short and long range reconnaissance, projectile (small arms) damage, explosives including rocket or projected explosives, fire, and any biological and environmental capabilities (things like poisoning wells, etc.). Lives: Pretty much always going to be #1. You have to live to survive. Resources: You have to be able to sustain yourself. I.e. You need food and water. Home – We need a place to live. It’s critical not only to security but shelter is necessary. Land – We need these to support our commodities. Outbuildings – We need these to support our other resources and commodities. Not as critical as the land but still very desired. Notice I used the phrase “very desired”? That isn’t an absolute requirement for survival however the presence of any resource or item on the list that makes survival not only easier but more efficient should be weighed as well. You list may not look like this one once you sit down and do some brainwork. Not a problem – my intent here is for you to use the information provided and develop your own. When you evaluate your list try asking yourself as many questions as possible in those areas. Even hypothetical ones. And be realistic. Questions like “Am I physically able to run a mile to displace if we’re overrun?” or “Is the threat likely to poison our wells and water supply?” or “How quickly would a fire spread across the pasture to my barn, home, etc?”. Simple questions like that will help you gain some real insight into just how valuable and vulnerable things on your list are. During this process you’re going to encounter something I call “Priority Drift”. That’s when one item is dependent on another – i.e. your cows (a resource) might be wholly dependent on your land if you don’t have another source of food for them. The way I handle that is by making a note that I need to take even greater measures to defend that item (in this case the land). So at this point we’ve identified our priorities and we know what we need to defend and where we need to focus our efforts. But before we do that we need to flesh out defensive measures and weight them against our resources on hand. Once you begin to brain through this no doubt you’ll figure out a few places you fall short. These go into your “defensive shortfalls”. Also include in that how much you rely on others to help or assist in the defense or recuperability of an item. Ideally you want to be totally self sufficient in defense but that may not be possible. This gets factored into the plan as an overall vulnerability. Add in that dependency I mentioned above and you’ll get a better picture of your overall vulnerability. This process can also be applied at the tribe level. Maybe you have a bridge that splits the tribal AO and has to be defended. Or a location that you use as an ad hoc aid station or clinic. Apply the same process and you’ll get a picture of your tribal priorities as well. Prioritization isn’t rocket science and it benefits from asking as many questions as possible and using every shred of information you have. Use some basic common sense measures and work through this and I’m pretty sure you’ll find it is a sound process. As a process it is part of the overall cyclic defensive planning process for rural areas which we’ll get into in the next blog entry. This entry was posted in Defensive Measures, Hardening the Homestead, Security Planning. Bookmark the permalink.